Not only did they "do it for a living," they did it almost constantly during Reagan's eight years, almost regardless of the circumstances. 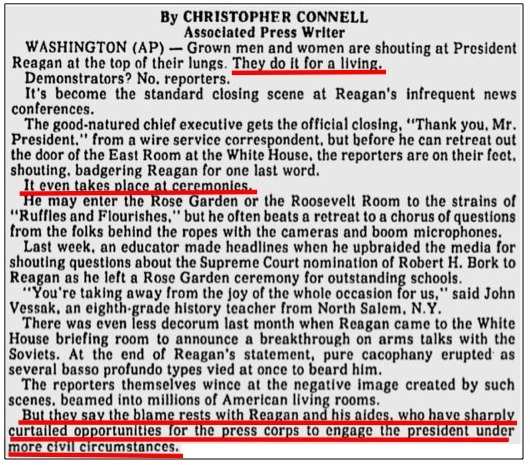 It appeared to be a strategy designed to make the president appaer aloof and stand-offish, when by 1987 (which is probably why Connell decided to cover it) it was clear that the press's image had been severely tarnished by its years-long virtually non-stop childishness. It got so bad that by Reagan's second term, the press was almost routinely interrupting equivalent presidential functions like the one Robert Bork was involved in as described above. I believe it's fair to say that Obama and his apparatchiks have limited direct presidential access to Dear Leader far more than Reagan and his handlers ever did. Shoot, at one point (and I believe it's still the case), Obama's people were deciding ahead of time who in the press would get the privilege of asking him questions. Now, all of a sudden, Neil Munro is a "heckler" getting a beat-down from the White House Correspondents Association amid speculation that The Daily Caller might "lose its access to the President and to the White House." What a bunch of flaming, presidential boot-licking hypocrisy.